Redbreast is one of the many whiskeys produced at New Midleton Distillery. It is a 'Single Pot Still' Irish whiskey, meaning that it is made from a mash of malted and unmalted barley. This 12-year old cask strength version appears to be the first ever release from 2011 (batch B1-11). It was triple distilled and matured in a combination of ex-sherry and ex-bourbon casks. The nose is rich and fruity: strawberries and marzipan flavours come first, followed by a good dose of wood spice, vanilla, and buttercream. Quite minty. Then there is a touch of sherry, followed by some grassy notes. The palate is medium-bodied and a bit spicy. The mint flavours are back, together with notes of oranges, grapefruits, and raisins. Later on there are cinnamon and biscuit flavours, followed by a hint of white pepper. The finish is long and dry. No news on the flavour side: mint, cinnamon, and grass. Notes of apples and liquorice appear later on and last to the end. This is an exceptional pot still whiskey, with a very complex nose and an equally complex palate. All these flavours are very well balanced, and despite the high ABV this can be easily drunk at cask strength. In my view adding water does not improve the flavour profile. Sadly, as I am not a big fan of mint flavours in whisk(e)y, this will not become a permanent fixture in my cabinet, but the quality of the spirit is unquestionably superb. @Pierre_W, it is always wonderful to read your reviews. I do agree with @Nozinan that finding mint in Redbreast 12 Cask Strength seems to me like an outlier experience, and not something I have ever encountered in the 3 or so batches of Redbreast 12 CS from which I have sampled. (I would not want to taste mint in my Irish Whiskey either.) In other words, I would suggest that you sample RB12CS from another batch, and, if you find it minus the mint, which I expect, then you might in future consider owning another bottle of it. Many thanks for your comments, @Nozinan and @Victor. Looks like the minty experience I had was not the usual thing to encounter with Redbreast 12 CS. Well, I am happy to invest another USD 100 in a new bottle. After all and except for the mint I liked this one very much. Thanks again! Irish Single Pot Still Whiskey has a reputation for being rich, oily and spicy. 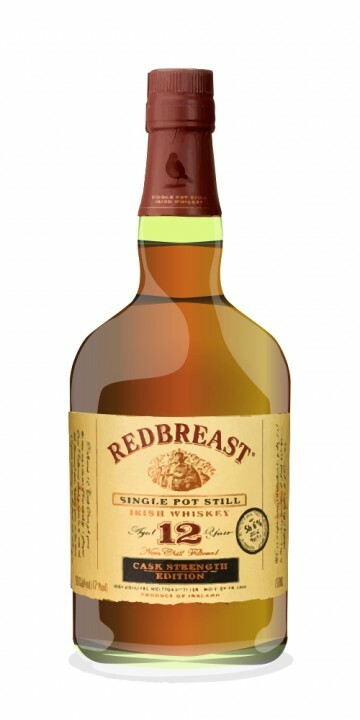 As far as I know, Redbreast is the best selling Single Pot Still in the world. Yet Irish whiskey doesn't get the adulation single malt scotch does. If your only experience with Irish whiskey is doing shots of Jameson on St. Patrick's Day the way Wayne, Squirrely Dan and Daryl shoot Gus N Bru on Letterkenny, you need to try some Single Pot Still. Bonus points if it's Cask Strength. Finish: Woah ! There's that Cask Strength alcohol burn. But the burn subsides fairly quickly and leaves rich brown sugar, buttered toast (malt biscuits? ), and a nice oakiness. The sweetness lingers on quite a while. Adding water really opens up this whiskey. It's still powerful (I dilute it to about 50%-52% ABV) yet the flavours become clearer. Freshly baked cinnamon buns with toffee come to mind. Or maybe it's caramel. I feel like there's a bit of a salty/briny note, but I'm not sure if it's there or if I'm imagining it. More orange and ginger. Rich, sweet dates on the finish remind us that this was aged entirely in first-fill Oloroso Sherry casks (if my Google-gleaned information is correct). This is simply terrific. I find it impossible to say anything bad about this whiskey. Every time I have a tipple of it, I'm elated yet sad. The elation obviously stems from the glory of the whiskey, but the sadness stems from the stark and sudden realization that this bottle is a smidge less full than it formerly was. Nevertheless, I recommend this if you like rich, full flavours. @OdysseusUnbound Did you ever have the 12 and the 12 CS into a H2H, or simply for the fun, one after the other. I did that a few times and as the 12 is always good the 12 CS has been closed, harsh with alcohol or like the 12 with a nice kick. So, except for Cask Strength Fanatic, I would advise most drinker to buy the regular 12. Although, it is true you can add water to your convenience to the CS. The CS is good, but the regular 12 is better IMHO. For those who doesn't know me, I usually prefer CS and I don't add water to them, so it was a big surprise to me when I came to that conclusion. Is there any other difference besides the inclusion of unmalted barley? I thought that was the entire deal. I have a bottle of Redbreast to open with my club in a few months, and I want to know what's what if the subject comes up. Thanks. I've very little experience with Irish Whiskey. A year an a half ago my political mentor and I opened a bottle of Writer's Tears, and I tasted a few here or there, but probably fewer than 5 different expressions. I came across this a few weeks ago listed but not available at the LCBO. When it finally appeared at stores it seemed like it was flying off the shelves so I picked one up. I figured it would be great H2H with a Writer's Tears CS I have. This one is 12 years old. It's been open 6 days, tasted 3-4 times, each time gassed. I reviewed in in my "usual manner", only I waited 20-30 minutes after the addition of water, a bit more than I usually do. I usually add a few drops of water to my whiskies. I found this one improved with considerably more, about a water bottle capful to a 20 cc pour. I also find it becomes mother and more flavourful with more time in the glass. I really like this whiskey. Although Irish is not a genre I usually go to, if I did have a “rotation” this one would certainly be in it. Anyone who likes unpeated, full-flavour whisk(e)y should try this. @Nozinan a very good review of one of my favourite whiskies.You should decant this one after 3 to 6 months to enjoy it at it's best.The quality of this whisky does drop dramatically after a year of air exposure! @Nozinan. I guessed that word was supposed to be "smoother". What better way to finish off an Irish tasting than with a pot still whiskey (one of my favourite styles), and a cask strength one at that? I believe this is the second batch of Redbreast 12 Year Old Cask Strength that Midleton has released. The colour is a light gold - lighter than I would have expected. Fairly shy on the nose, I get freshly sawn lumber, apples, vanilla and cinnamon. Slightly vegetal, with cucumber and spinach greens. A very light metallic quality. Water brings out some malt, but not much else. Definitely needs more time in the glass (the bottle was opened yesterday, as were the Bushmills and Powers I just reviewed). Behind the alcohol heat, the palate features red apple skins, lime pith, lightly toasted oak, pepper and linseed oil. Where the nose was shy, the palate is quite powerful, especially with water. You can definitely tell that it is pot still whiskey like this that forms the background to the Powers Gold I just tasted. The extremely long finish features much more oak, with leather and tobacco. While the nose may be a touch lacking in power, all elements of this fantastic whiskey feature great complexity. Although I may be finishing off this review now (as I'm starving and have to eat), I'm leaving this in my glass for a good long while. Jim Murray scores this a 97 - the slightly quiet nose prevents me from going that high, but still - this is truly a great experience. I may be a day late with most of my Irish reviews, but this was one worth waiting for. @talexander i was getting the pricing info from whiskybase. three stores selling a 2015 release for less than 60 euros. i've never come across a bottle on a shelf, myself. If you call yourself a lover of aged spirits, go buy this whisky. Nose: Chocolate, bread pudding with cinnamon and brown sugar. Alcohol resides below the surface. Taste: Interesting spice profile, slight alcohol burn but very manageable. Sweet, smooth, and luscious. Like a warm spiced apple dumpling with vanilla ice cream melting over my tongue. Finish: Chocolate returns, mixed with cinnamon spice. The spice fades and leaves a honey sweet coating that lingers until I take another sip. Balance: Amazing whisky. Smooth for cask strength and with layers upon layers of flavor. A must have in any collection. Still one of my all time favorite drams. Along side the regular Redbreast 12yo expression. And lately, I have been really taken with the fruitiness and all round balance of Powers Signature Release. Already stocking up for St. Patrick's Day 2015, and onward. Oh yes! These are the moments you wait for. When simply bringing the glass to your nose gets your pulse racing because you know if it smells this good it's going to taste even better! Irish whiskies are making a huge comeback of late. I read some where that for the first time since 1930 the US consumes more Irish whisky than Scotch whisky. Quite a remarkable statistic that. Must be all those awards they've been picking up in the last year or so. This cask strength liquid gold being one of them. Owned by Irish Distillers this cask strength version is basically their standard 12 (which is bottled at 40%) but with more bite. While matured almost exclusively in Oloroso casks it does not allow the sherry to overpower. Instead it maintains a firm grasp on the integrity of the spirit. This style of whiskey is now exclusive only to the Irish and is known as Single Pot Still irish Whiskey (by law). This basically means that a combination of malted and un-malted barley is used in the production process and the spirit is triple distilled in a single pot still. Nose: Absolutely gorgeous. Very sweet. Almost winey. But has a pinch of salt too. Honey on pink lemon. Love hearts. Nectarines on top of vanilla sponge cake. Ripe figs and unripe bananas covered in sweet lime. This one renders you almost speechless. Palate: Lots of spicy citrus. The same honey on melon but now with a dash of oaky cinnamon. All of this against a backdrop of soft fruits expertly complementing the spices. Finish: Arrives late but when it does it stays. The fruits are back. So are the spices. I know the Scots and the Irish are always arguing over who invented whisky. I don't know the answer to that. But I do know who just might end up doing a better job. I opened this bottle on my birthday (October 10th) along with a few other cask strength bottles. Here are the notes from that experience. Nose: Super hot on the nose. WOW!! Fresh fruit straight away: sweet red apples, pears, and strawberries all hovering over a base of oak. After a little time I am really picking up on some bourbon flavors – that sweet bourbon nose of caramel, apples, brandy, butter, and brown sugar. Perhaps a bit to bourbony for my nose? Still, you can tell it isn’t bourbon. There is an almost saccharin type sweetness to this nose. Finish: Huge grassy finish with tons of tart apples (red delicious, gala, fuji, and granny smith), and very spicy: tons of pepper, cumin, cardamom, cinnamon, and all spice. Big and long for a triple distilled Irish whiskey! No crazy caramel! Complexity, Balance: Quite complex for an Irish whiskey. I love the extra kick from the cask strength. The apples and fruit cross the spectrum while allowing other notes to pop up and around for little added bits of curiosity. I can’t fault it for much. Everything is behaving just as it should. It is everything Glenfiddich and Glenlivet should be! Aesthetic experience: I really like the color and look of this bottle. It is very elegant and traditional looking – seriously it looks like a whisky bottle from 80 years ago . . . if it were being made today . . . to my imagination . I also love the batch stamp with the ABV. It is reminiscent of the new Laphroaig design. Very little not to love in this totally unpeated non-scotch. Conclusion: I don’t love easy going whisky. In my mind that is the very definition of Irish whiskey. So this is one of the few Irish drams I was possibly going to like. And I do like it. Further, it takes water very well. I watered it down to 40% and found it very good – this is highly unusual for me. I almost always dislike water in my whisky. This is a huge exception. I highly recommend it. I'm glad you are enjoying your bottle. I bought a bottle last year and didn't much care for it. Oh well. It was very expensive, as well, for what it is. I paid $80 American for it. This said, I didn't water my glasses as much as you watered yours. Maybe that was my downfall. To me, it wasn't a fruit bomb. It had a sickly sweet hard alcohol flavor that didn't open up for my tastebuds much as all. It reminded me of Cutty Sark, a whisky I have never learned to love since I was in my late teens and first tasted it. Thanks for your review. You express yourself well. @Victor thank you. Yes, I have enjoyed it. I found one bottle here in the unique store that seems to carry the few "special order" items that come through Virginia (same store where I found the last bottle of Elijah Craig Barrel Proof in the state). I think I bought the last bottle of Redbreast CS. I’ve been a fan of the standard Redbreast 12 for sometime now; it’s easily one of the best Irish whiskies readily available here in North Carolina. I picked this bottle up back in September 2012 while in Ireland for a wedding with my wife. This was our first trip to Ireland. While I was there I also got a chance to taste the Redbreast 15, Powers John Lane 12, Green Spot, and several of the different Jamesons. When it was all said and done I came back with the Cask Strength; however, a bottle of the John Lane almost made it back too. I’ve been waiting to open this for some time now and tonight was the night; after all it’s St. Paddy’s Day! Upon the first sip I was instantly taken back to The Stags Head in Dublin where I first had this dram. To me this is a truly magical whisky and one I will try to save for special occasions. This was tasted neat from a newly opened bottle in a Glencairn glass. No water was added. This bottle was batch B1/11, bottled at 57.7% ABV. Nose: Strong vanilla, slight burn due to the high ABV, bananas/fresh baked banana bread, somewhat floral (smell of local honey), apples? Balance: Very smooth, nothing overpowers, the flavors blend so well, the nose really translates well into the taste/palate. Overall, this is a great whisky. I feel like it’s a step up from the Redbreast12 and from what I remember it has a richness that wasn’t found in the 15 (however, the 15 is no slouch). Being mainly a scotch drinker this added spiciness really appealed to me. I look forward to seeing how this bottle will mature over time and I will try to update this review in the near future at which time I may try it with touch of water. The reviewed bottle has been open about 6 months and is 2/3rds full. Taste: the nose flavours translate gloriously. This is sweeter on the palate than in the nose. Fantastic! Balance: it would be absolutely criminal if this wonderful juice is not continued indefinitely at this extremely high quality level. This is "95-Class" all the way. @OlJas, yes, whisk(e)y in general has huge differences in distribution, availability, and pricing. Knowing what things cost generally, and in advance, is a necessary requirement to knowing whether the price you see in front of you is a bargain, a typical offering price, or a rip-off. Once in awhile I will see something offered and think, "Hey, that is a VERY LOW PRICE for that whisk(e)y." Sometimes it has been hard for me to pull the trigger and buy it because it wasn't one I was thinking of getting at that time...but, when I did buy it, I have never once been sorry I did buy it later...and have generally seen the same product thereafter offered at much higher prices. Apropos of Redbreast 12, our local stores sell the standard 12, but not the Cask Strength. Standard Redbreast 12 in my county went from $ 42 to $ 59 recently. That is a 40% increase in one increment. I had to hussle to find a bottle of the Cask Strength, because it is pretty rare around DC. @PeatyZealot, Redbreast 12 Cask Strength is easy to like. There doesn't seem to be much supply of it, though. After I got a bottle early, about a year ago, I haven't seen anybody locally who had any for sale. I would like to get some more of it. Redbreast is an Irish Pure Pot Still whiskey, meaning the mashbill contains both malted and unmalted barely. It is created at the Old Middleton distillery. The Redbreast 12 Year Old and 15 Year Old are already highly regarded, but since the end of 2011 a 12 Year Old cask strength edition has been added to the range. It is bottled at a massive 57,7% ABV. The first batch is a vatting of 68 casks, a mix of bourbon and oloroso cask, so there is plenty to go around. A very stout nose on baked banana, drenched in caramel. Creamy! A lot of spices, to many to name, enriching the nose tremendously. It literally makes my mouth water. Fairly straightforward, but oh so good! It explodes on the palate. Vanilla, milk chocolate, preserved fruit, grain and quite some oak. Thanks to the cask strength, it is very spicy with hot chili and woodspice in the lead. Again very creamy with a large dose of caramel and toffee. Boy, this is so enjoyable. Not overly complex, but who cares when a whiskey is that good? The finish is very long, very sweet and spicy. Vanilla and caramel linger a long time. I already enjoyed the Redbreast at drinking strength, but this is extremely nice (for an Irish, at least). Around 65 EUR, although I have not seen it around in Belgium too much. Recommended!